On Sunday I ran the ninth race in my 2016 challenges. On this occasion I was far from alone. 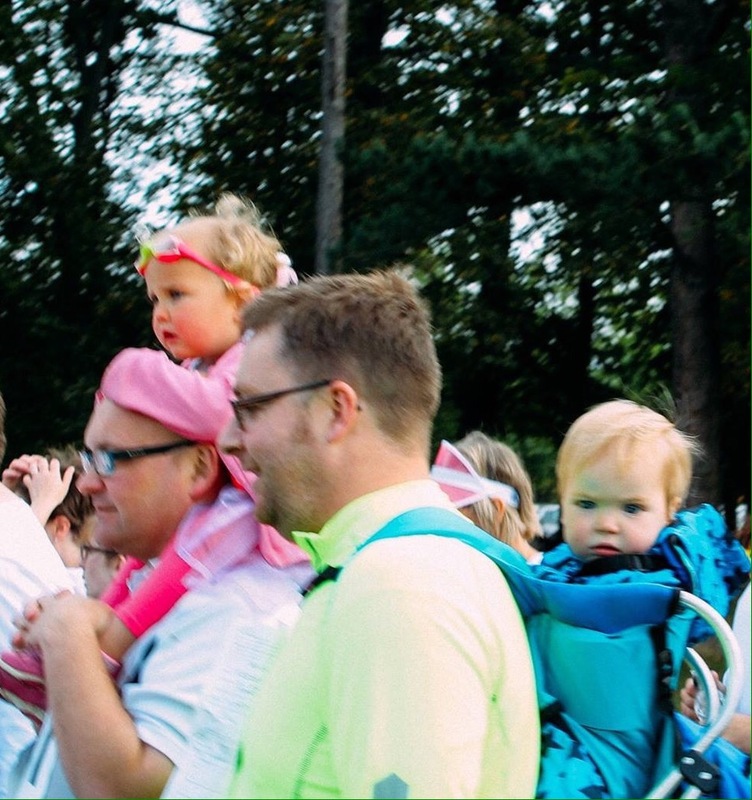 This race was the Teesside Hospice Colour Run and we were running as a pack. My father in law, sister and brother in law and his sister. My sister and her husband and her two monkeys. Last but not least, myself, Mr LMR, Top, Middle and Little Miss Monkey. We were enmasse supporting a very worthy local cause, that we had personal links to. It was an amazing way to end a summer of fun runs, surrounded by family. Running with a pack of monkeys felt like a risk, but the gamble definitely paid off. All we needed was to chase a few rainbows. Teesside Hospice is a local facility which Mr LMR’s family have a personal connection with. It offers support and comfort to patients and families often at the end of their lives. There is a multi disciplined team, who focus on pain and symptom management. 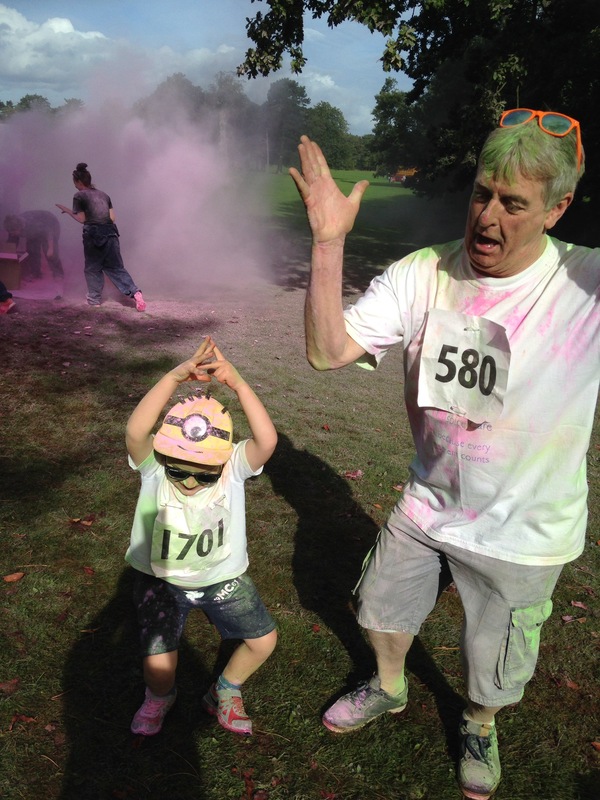 It is an invaluable local resource and, it is no wonder that the colour run sold out weeks before the event. I can safely say that, in the past, we would not have been brave enough to undertake such a venture with the monkeys. Particularly one monkey, given his unpredictable behaviour. There have been tantrums and rows on other days out involving the undertaking of physical exercise. Often a whole day being spoilt, by the temper of just one. Don’t get me wrong, all of them have been guilty on occasion but one stands out. I will not name and shame the culprit, but those in the know, know who I am talking about. However, over my last year of running, said monkey has taken a change in temperament. Accompanying me to spectate my monthly ventures appears to have ignited a small spark of interest. It was this spark that I jumped upon when the offer to sign up for The Teesside Hospise Colour Run was first suggested. The intention was to run in honour of a family member cared for by the Hospice in her final weeks. This was the first ever Colour Run on Teesside and, hopefully it will not be the last. So with my spark of enthusiasm and the added incentive of making rainbows while we run, I signed us up for another running adventure. I must say that none of the monkeys were a disappointment. The forecast was for early rain, but for this to clear by the start of the race. We walked to the start line in drizzle, Mr LMR and I apprehensive as soggy monkeys can often turn to grumpy monkeys quickly. Luckily the excitement of the race was enough to keep them jumping and dancing all the way to the start line. So far so good. Even a staggered start which saw us waiting around about 10 minutes to get going didn’t cause too much grumbling either. As we were given the green light, our little party was quite secure in last place. In fact for most of the race we were accompanied by the last man Marshall on foot. You will be aware that I have no fear of being last man and the monkeys seemed to feel the same. At the start line, 5k felt like a long way for such small legs but they all took it in their stride, even the youngest on foot (LM was in the back pack with Mr LMR) just got on with it. They ran between colour stations, guessing which colour was next. Never totally out of breath. They put us grown ups to shame. 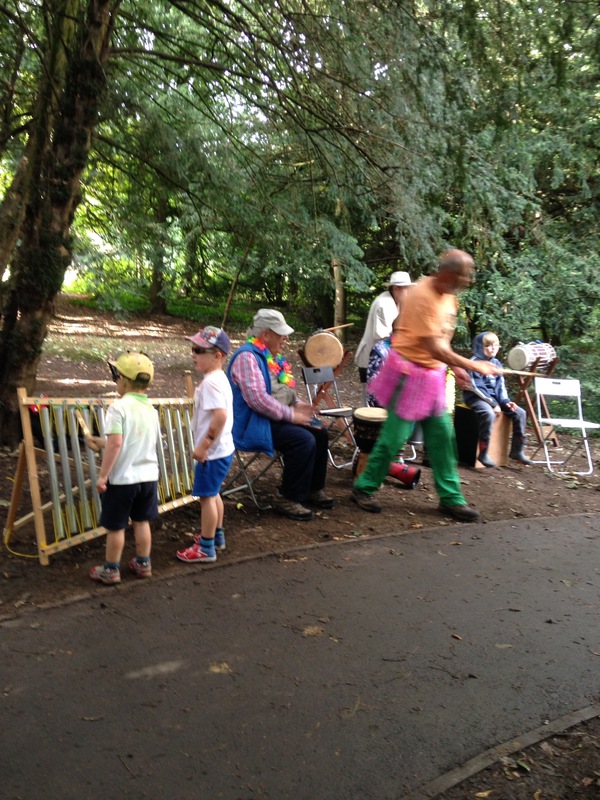 They even had time for a musical interlude in the woods. As I have said before, if you are looking to get into running, signing up for a charity race is the place to start. You will find all ages, abilities, shapes and sizes well represented. If you have apprehensions about your monkeys capabilities then try to stay open minded. They really can surprise you. On our way for after race drinks and Sunday dinner, Mr LMR and I returned to the topic of junior parkrun. It is something we have considered but, the extra 9am start after a week of school runs seemed a bit much. However, the pace and ease that they were able to completed this run in was enough to encourage us back into the discussion. An incentive might need to be thought up however. Mind you the monkeys were encouraged into this one with the prospect of a medal, which sadly turned out to be a pink water bottle. We held our breath for a disappointed tantrum that actually never came. So in the end they surprised us in more ways than one. This race was the end of my summer of more relaxed and manageable runs. However, over the summer, I have been training less and marching around the park in inappropriate footwear. I have become a bit lazy and my muscles a bit misaligned, with tight calfs. The only thing for it is a challenge. Next month sees the return of the Tees Trail Winter Series. Where my 5k challenges began all the way back in January. Even though it means the end of my 2016 challenges is just round the corner, these races will not be an easy end. Chances are it will be cold, wet and muddy. In a time of dark nights and, for me, a change in mood, a gritty challenge to keep me focussed is important. I’m ready to take it on. After my last run though, I hope I can take a few rainbows with me. Nice one Lou, seems like a great day out was had by all!